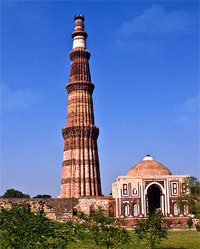 The Qutub Festival is organized on the premise of the Qutub Minar. Generally the festival is held during the month of October-November. The dates of the festival vary every year though. The festival is a congregation point for the performers who promote various Indian arts and musical forms. Various recitalists from all over India come and gather on the premise to show classical art forms. Qawwali, Ghazal, and Sufi musicians perform on stage and whole Delhi enjoys the magical tunes of music. Expert and skilful veteran folk musicians and performers showcase their talents during this spectacular ceremony. Various Indian dance forms are the attractions of the festival. Kuchipudi, Odissi and Manipuri are the names of few genres. Different food courts are present on the premise to serve delicious delicacies of various Indian regions.